Professional industrial grade gas/oil/waste fuel fired boilers to meet every specification. 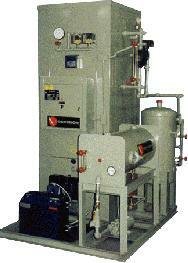 George K. Moss Co., Inc. can provide skid mounted packaged boiler systems that range in size from 25 - 100 HP. Our systems can include boiler feedwater system with pumps, water softener, chemical feed system and blowdown separator. All you need to do is supply a steam line connection, make-up water, condensate return and electrical supply to our panels and you will have a nice, neat boiler facility that is dependable and efficient.